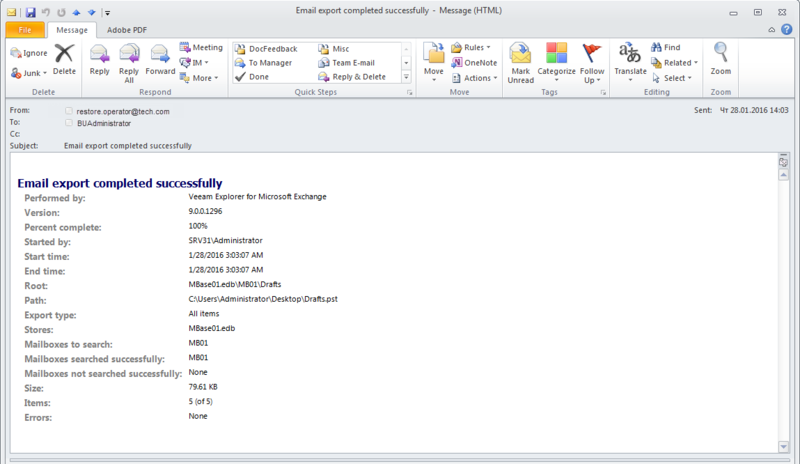 Veeam Explorer for Microsoft Exchange can deliver detailed reports on export results. The following table lists fields of an export report. Shows by which component a report has been generated. Veeam Explorer for Microsoft Exchange build number. Total number of items included in the .pst file in per cents. Shows by which user account a report has been generated. The relative path to the object within the mail database. The path to the database file. A datastore that contains exported items. A mailbox that contains exported items. Results for Mailboxes to search. Total size of exported items. Shows the number of exported items. Shows how many error have occurred during the export. The title of a report will be shown as Email export completed partially. The Percent complete field shows how many items from the search scope matched the specified search keywords. Hits. The number of exported items that matched the specified search keywords. Mailboxes. The number of mailboxes comprising the search scope.